In the November 2013 cover story, “Hiring heroes,” we shared two “My military experience” stories of business owner-veterans and how they’ve turned their military service into private-sector success. Here’s another: L.G. 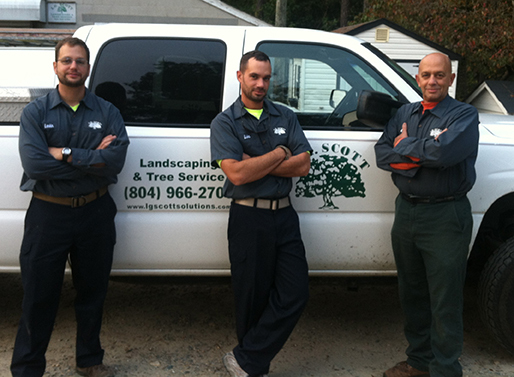 Scott Landscaping & Tree Service in Providence Forge, Va., is a family business and the Scotts are a military family. Vice president, L.G. Scott Landscaping & Tree Service in Providence Forge, Va.
During my 11 years in the military, I’ve deployed to combat twice. Those combat experiences taught me the importance of perspective. Nothing we do in landscaping, though sometimes we have those terrible weeks, is as bad as the threat of imminent death. That perspective helps me stay calm. Also, through my military service I’ve gained valuable experience in almost all of the management functional areas: maintenance, human resources and operational planning. Without adequate maintenance of equipment, a landscaping company cannot succeed. Our equipment must work when we need it to in order to meet the timelines required by the environment and to meet our customers’ expectations. The military has excellent maintenance practices for their ground and aviation equipment. The courses I’ve attended as well as the hands-on experience I gained have given me a starting point for our business. Landscaping is a service. Even in design/build work, we’re providing a service, albeit through construction of a landscape or hardscape. The heart of any service company is the people involved; that’s where human resources comes into play. In the military, leaders are responsible for all aspects of their soldiers’ lives, even down to their off-duty time. Military leaders are taught to never rest until their troops are taken care of. To me, that idea is the core of good human resources. The practical experience of handling the various issues presented to me in the military has made it easy to flow into handling the human resource issues of a small business. In the military I gained valuable experience in operational planning. As an officer I always keep the mission foremost in my thinking and work back from there. Correction: In the November 2013 print edition, the Web Extras box on page 22 referencing L.G. Scott Landscaping & Tree Service incorrectly stated the company is based in Pennsylvania. It is located in Providence Forge, Va. The editors regret the error.